On Micol: Victoria's Secret bikini top. The weather in NYC has been pretty on and off lately, but this past weekend the clouds managed to part just long enough for Micol to throw her housewarming luau party, complete with tiki torches, a wickedly strong tropical punch, colorful rafts perfect for keeping afloat while sipping cocktails, and leis aplenty. Even Gideon, her new pooch, came dressed for the occasion in a blue garland that of course matched the one his mom was wearing. You look great, and we should definetely have a luau soon, súch a great idea as it is not common in Europe! It sounds perfect - love all of your attention to detail! Punch recipe sounds strong but good!! wow looking fabulous! this looked like so much fun! Poool party!!! I'm loving the vibe of this festive summer shindig, and I'm quite frankly insanely jealous that you have a rad-tastic pool and floatie situation at your disposal. Green, ladies. Absolutely green with envy! OMYGOSH I'm totally jealous of Micol's backyard! 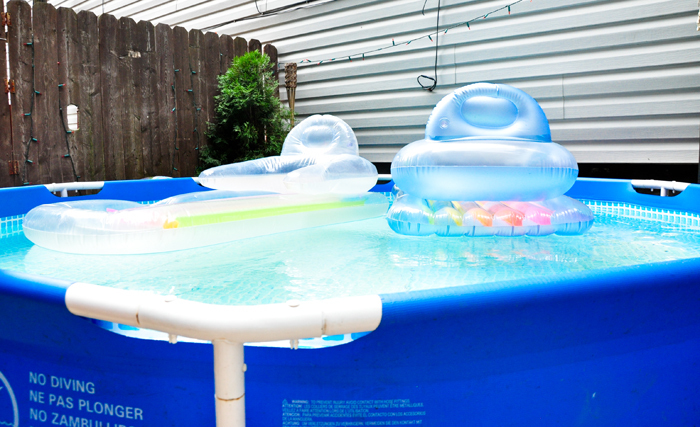 I want a. a backyard and b. a big enough one to have a pool. How awesome. You ladies look beautiful. Loving the crown of flowers. Great looks, I wish I had a pool to hang out in. I love your tropical ...New York pictures!!! What a fun photoshoot! Love the colors in your pictures. OMG these pictures look like so much fun! Great scene - this weather calls for it!! colored ice cubes!? and a pool in Brooklyn!?? You're my heroes. I've never even had a yard! What a great idea! Just goes to prove kiddie pools aren't just for kiddies ;) Looks like you (both) and the pooch had a great time and this punch sounds killer! Awesome pictures! Love that floral crown!! 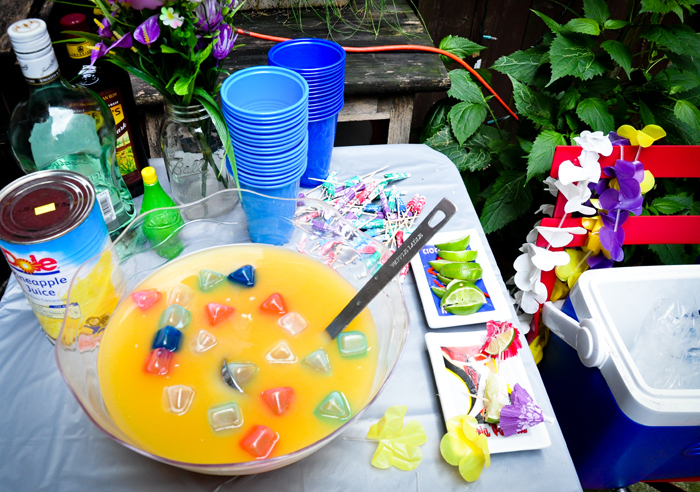 I went to a summer backyard party in Brooklyn many moons ago and it looked just like that! Great photos as always! wow. these look so amazingggg. Where in nyc are you from? it's like my dream to move there to work in fashion. Love the fact you can do such a pretty Luau in NYC! Great idea and pics! Love the colors.